Give your bar area a fashionable upgrade with the Diamond Bar Stool Black. A real gem of a design, the Diamond has an upmarket appearance that adds a touch of modern class to its environment, whether that’s a kitchen, bar table, or breakfast bar. 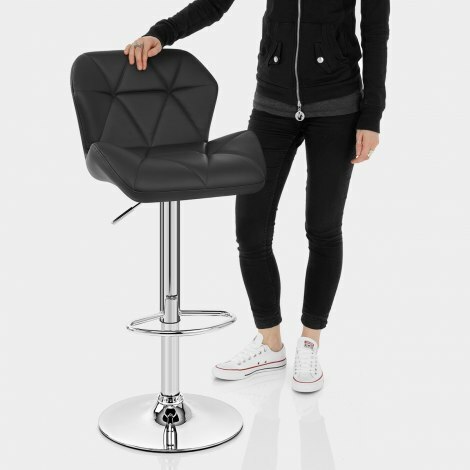 A distinctive design, it is covered in smooth black faux leather and is densely padded on both the seat and medium backrest for comfortable support. Embracing its name, it features a stitched detailing that creates stylishly modern diamond shapes upon the material. Contributing to the futuristic look, the seat is also finished with angular edges that gently rise up to securely hug the body whilst seated. 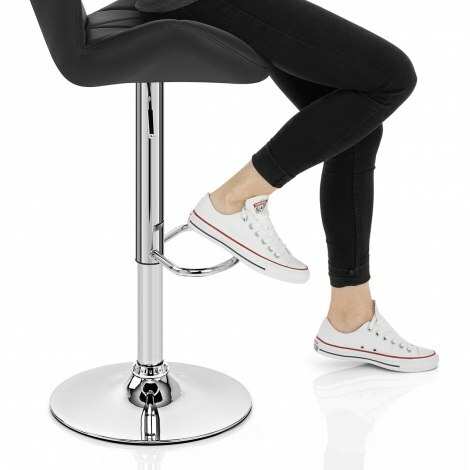 Suspended on a sleek polished chrome frame that includes a handy footrest, the stool houses a gas lift mechanism for variable height adjustment and the ability to rotate a full 360 degrees. Completing the Diamond’s design, the circular base includes an underside ring that will aid in the protection of your floors. "Beautiful Stools, a feel of luxury about them"
Beautiful Stools, a feel of luxury about them, sturdy and very well made, certainly feel more expensive than they were. So simple to assemble that the wife could do it. She didn’t but she assures me she could’ve done. Found very smart and practical stool. Neat little stools, reasonable price. Fast delivery and great price for delivering to Northern Ireland. Have shopped with `Atlantic for all my bar stools over the years, they offer such a good selection and cover all budgets. My latest purchase are quality budget chairs, they do a great job and look fine at my breakfast bar. They are lightweight and functional, definitely a good buy. Would recommend them for the price. Was just as expected, good fast delivery service.